Two 21" × 32" maps, 30 full-color counters, and a ziplock bag to hold them. 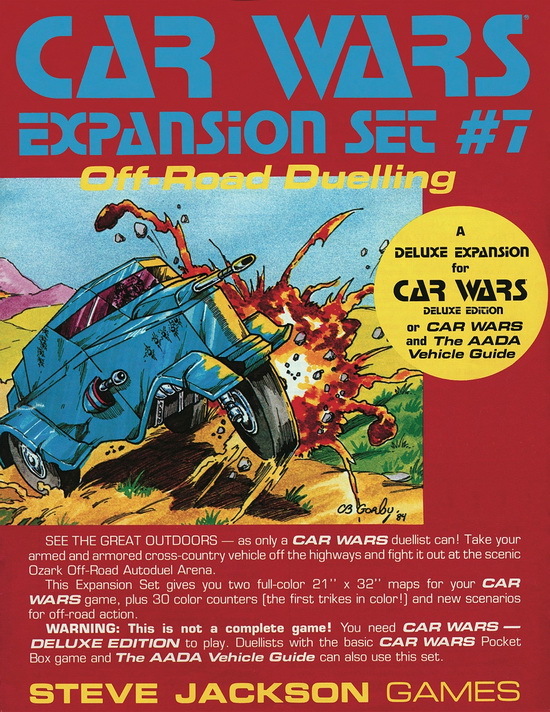 See the great outdoors – as only a Car Wars duellist can! Take your armed and armored cross-country vehicle off the highways and fight it out at the scenic Ozark Off-Road Autoduel Arena. Firepower – all the weapons your three-wheeler can mount . . . because the other drivers are out to drive you off the road for good. This set gives you two full-color 21" × 32" map sheets, 30 full-color counters, and new scenarios for off-road action. 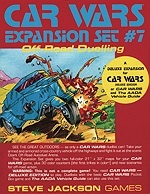 Car Wars Expansion Set 7 – Off-Road Duelling needs Car Wars Deluxe Edition to play. Duellists with Car Wars Classic and The AADA Vehicle Guide can also use this set.